You will absolutely wow your guests when you serve these mini desserts! 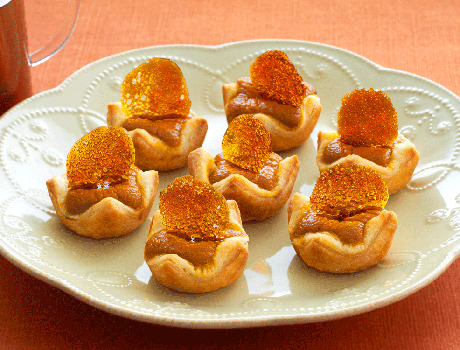 Puff pastry cups are filled with a rich pumpkin mixture and baked until golden. 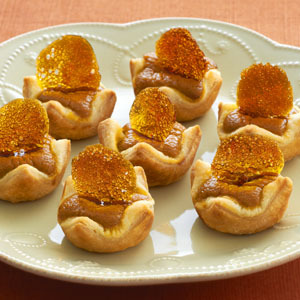 Dressed up with a caramelized sugar round, theyre guaranteed to earn rave reviews. Heat the oven to 400°F. Spray 36 (1 1/2-inch) mini muffin-pan cups with vegetable cooking spray. Beat the egg yolks, pumpkin, heavy cream, brown sugar, pumpkin pie spice and salt in a medium bowl with a fork or whisk. Sprinkle the flour on the work surface. Unfold the pastry sheet on the work surface. Roll the pastry sheet into a 12-inch square. Cut the pastry into 36 (2-inch) squares. Press the pastry squares into 36 (1 1/2-inch) mini muffin-pan cups. Spoon about 1 tablespoon pumpkin mixture into each pastry cup. Bake for 15 minutes or until the pastries are golden brown and the filling is set. Let the pastries cool in the pans on wire racks for 5 minutes. Remove the pastries and let cool completely on the wire racks. Place the oven rack in the upper third of the oven. Heat the oven to 450°F. Line 2 baking sheets with parchment paper. Create 18 (2-inch) circles of sugar on each baking sheet, using about 1/4 teaspoon sugar for each circle. Bake one baking sheet for 5 minutes or until the sugar circles are bubbly and a deep caramel color. Let the sugar circles cool completely on the baking sheet on a wire rack. Repeat with the remaining baking sheet. Using a small metal spatula, remove the sugar circles from the baking sheets. Press 1 sugar circle at an angle into the top of each pastry.